A U.S. Border Patrol agent sitting in a marked patrol vehicle was shot at from the Mexico side of the border early Sunday morning, U.S. Customs and Border Protection (CBP) said Monday. The shooting occurred immediately north of the U.S.-Mexico border, about one and a half miles west of the San Ysidro port of entry in southern California, according to CBP. The agent was not injured in the shooting. 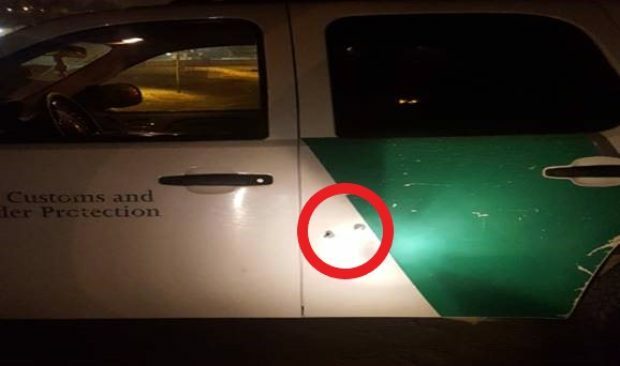 A CBP photo taken after Sunday’s shooting shows a Border Patrol SUV with what appears to be two bullet holes in the rear driver’s side door. Border agents contacted Mexican authorities when they determined the shots appeared to have come from the Mexican side of the border, CBP said. Mexican police responded and detained two suspects, one of whom was found in possession of a handgun. The second suspect was later released. FBI agents are handling the investigation into the shooting, CBP said.